After awhile, Crocodile. See you soon, Baboon. LATER, GATOR. Gator's moving, and he's so sad to say goodbye to his friends. Worst of all, he doesn't know anyone in his new neighborhood But with a little help--and some encouraging letters--from the good pals he left behind, Gator realizes what he has to do. Just say . . . HELLO And with a Howdy do, Kangaroo and Good afternoon, Raccoon, Gator soon feels right at home. A group of adorable animals, and fun-to-read-aloud text, make this the perfect encouraging story for any new kid in the neighborhood. 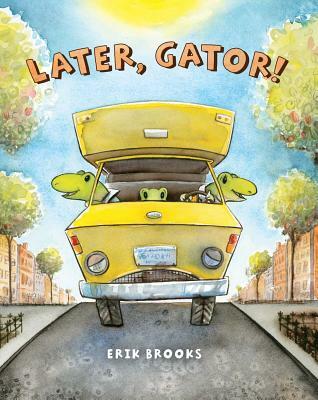 After moving five times as a kid, author-illustrator Erik Brooks knows how hard it can be to say goodbye. He also knows that a new hello or two can help a LOT! When not drawing, writing, or visiting schools and libraries, you'll find him coaching cross-country and track at the local high school, running, skiing, and wandering through the North Cascades. Erik lives in Winthrop, Washington, with his wife, Sarah, and daughter, Keeley. Say hello to Erik online at erikbrooks.com.